Epstein House is an excellent investment opportunity as well as a viable business opportunity. Epstein Guest House comprises three storeys with nine guest rooms, each with it's own en suite facilities. The number of beds available varies from room to room with a total capacity of 25 and all rooms are en-suite with tea/coffee making facilities. The guesthouse is the former home of the Epstein family and Brian Epstein, former manager of the Beatles. The classic décor of the hotel is both inviting and interesting since, in order to accompany the traditional look and feel of the guesthouse, there is a great deal of Beatles memorabilia on show for residents. These are present mainly in the dining and bar areas where a copy of the public record and other evidence is on display accompanied by a number of rare signed photos by the band. On the ground floor, the entrance hall leads into the lounge where there is a large screen T.V, comfortable seating and dining facilities. The bar is fully licensed and is made available to guests throughout the day & night. The French doors lead directly into the patio/conservatory area overlooking the large, eloquent garden area. At the bottom of the garden area is a gated entrance that leads onto the stunning setting of Stanley Park. The guesthouse is situated on Anfield Road in the Anfield district of Liverpool, which is a stone’s throw away from Liverpool Football Club. The guest house is ideally situated for visitors to the city, those who are attending matches or visiting the club museum. 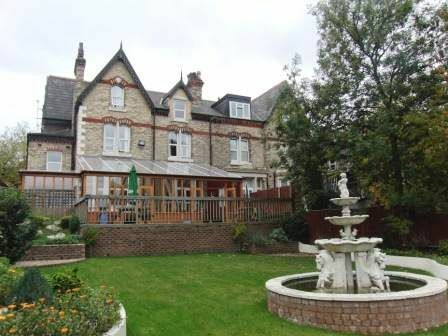 The guest house is only two miles from Liverpool city centre with a frequent bus service present. Epstein House is a great favourite with those looking for a place to stay, whether just visiting Liverpool for shopping at the Liverpool One shopping centre or the Albert Dock. The business owner has not fully exploited the opportunity to tap in to the tourism market which could include the retail in tickets to football matches, Beatles Tours, musical shows, etc that the city has to offer.